On Tuesday afternoon I was asked how many were expected for this trip. Two hours later it had risen to seven and then an hour later two more told me they were coming. Imagine my surprise when I arrived on site to find a further two had decided to come along making us a large enough group to form a football team. Would we be good enough to compete in the World Cup? The sky was a glorious shade of blue and the sun was beating down so it was clear that we needed to get as much done as quickly as possible before we were overcome by the heat of the afternoon. The Haycop is an excellent mixture of habitats in a compact site with rough grassland, meadows, heath, woodland and a pool. A lot of work is done by volunteers maintaining it and I am pleased to say that they maintain it for the wildlife rather than to make it look nice. Long may this continue. We started off in the rough grassland. 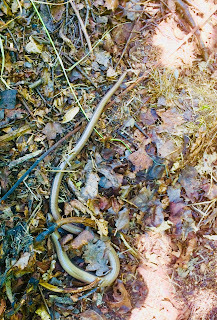 Many mini-beasts make their home in such a habitat. Many make their living off the vegetation but they always need to keep an eye out for predators. 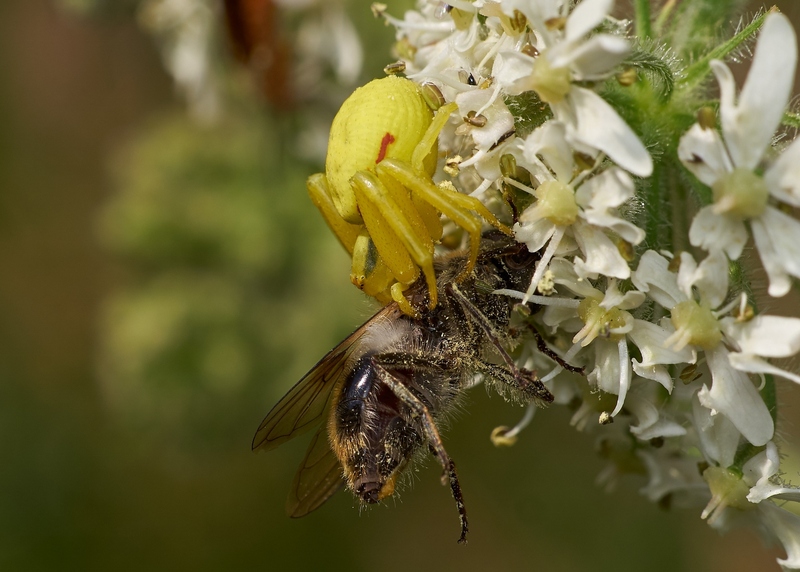 One such predator is the spider Misuena vatia which lurks often on flower heads waiting patiently to ambush anything that passes. I have seen it take a bumble bee in the past. In this case it has taken a hoverfly. The next object of our attention was the pool and its surrounding vegetation. 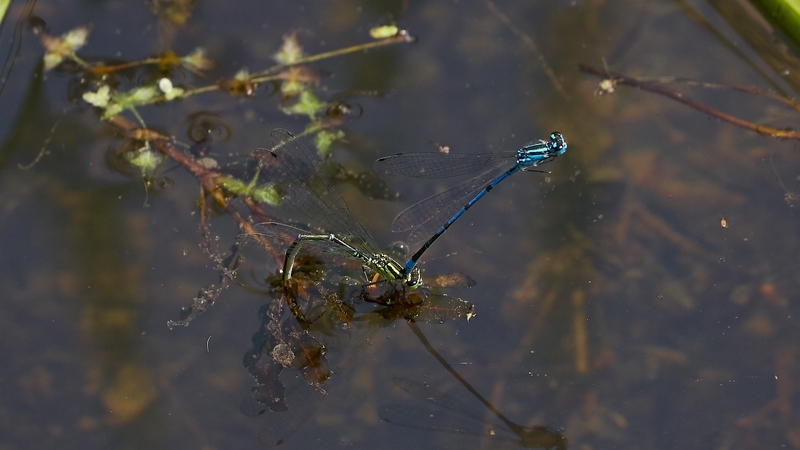 There was plenty of activity in and above the water with damselflies lazily meandering about the emergent vegetation. This behaviour contrasted with the frenetic activity of a Southern hawker which dashed hither and thither about the pool. 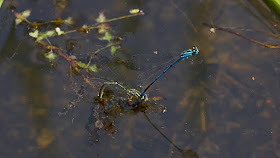 A pair of Azure damselflies were photographed as the male "escorted" the female as she laid her eggs. 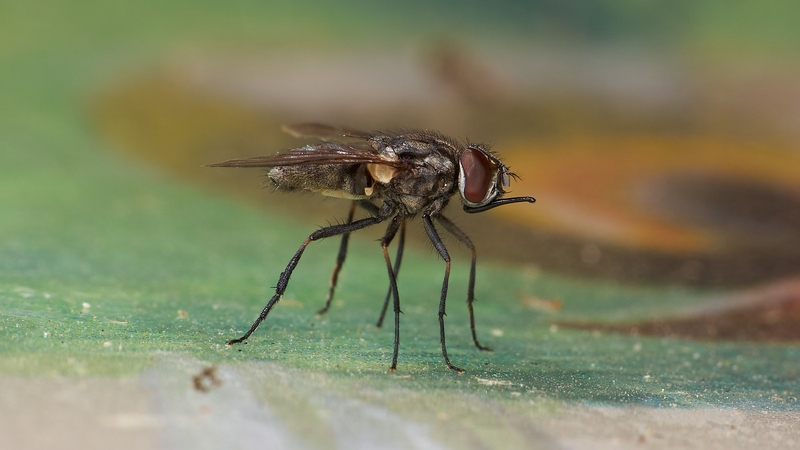 Our fly-catcher asked for a fly to be photographed. Many flies need to subjected to microscopic examination to determine the species but this one can be done from a photograph. Unfortunately I do not know what it is! But our fly-catcher assured us that "it'll be that one or the other"! It was time for a rest!! We climbed a grassy bank where some of us had a sit down and took on water. At this point we welcomed an old, old friend - Auntie Betty's tablecloth. "Aunty Betty's tablecloth" first made its appearance long before the Joy of Wildlife walks its predecessors were conceived. A group of us used to do surveys organised by the Shropshire Wildlife Trust. A sheet was produced by its owner to use to catch things beaten from trees and it was immediately christened by another of that group. After several years tucked away in a cupboard it made its reappearance at The Haycop. We found a teneral instar of a shieldbug, which I think is a Green shieldbug. 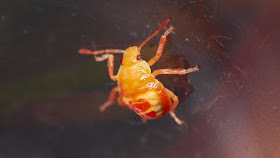 It has just moulted emerging in these bright colours. Over the following few hours it will gradually take on its normal colours. We made our way further up the hill by a variety of paths to lunch in the meadow and heathland. This area provided an excellent view of the church in Broseley. 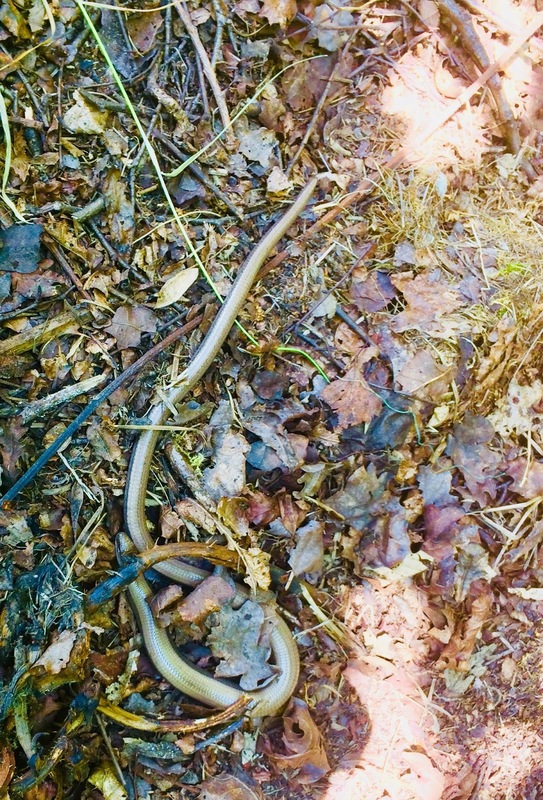 There are a number of metal sheets laid out in the trees that surround this area and a slow worm was sheltering under one of them. Several butterflies were dashing around this area including some skippers. Several were caught to see if one of them was an Essex skipper, a recent arrival in the county. 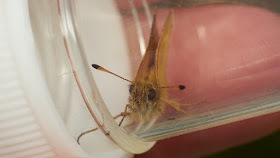 And, yes, one was an Essex skipper. An identifying feature is the black tips to its antennae. The heat was increasing, time to move on and find some shade! We retreated to the woods and made our way slowly back to where we started. Another wonderful day in an excellent site. We are very lucky that we have so many sites of interest within easy reach. My thanks to the Friends of Haycop for allowing us to visit and do what we enjoy doing and to the photographers David Williams and Paul Watts for allowing me to use their photographs.